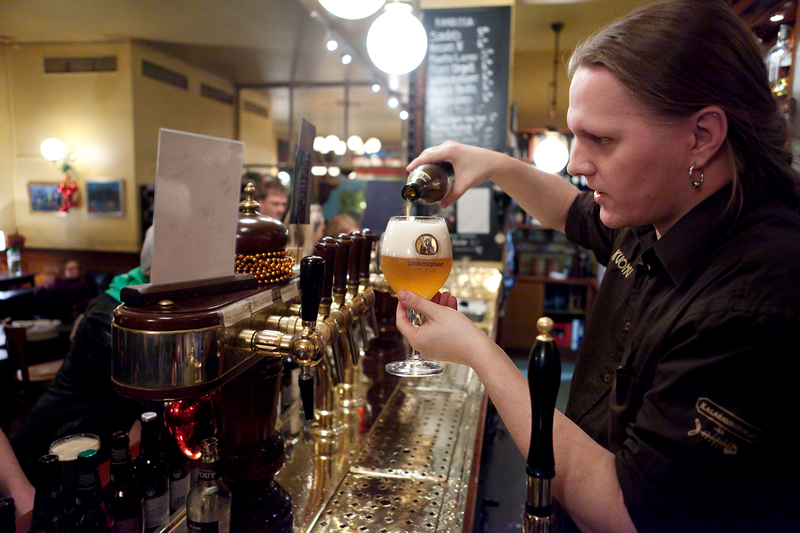 Have you ever been told that Finland is considered to be a beer country? Probably not. 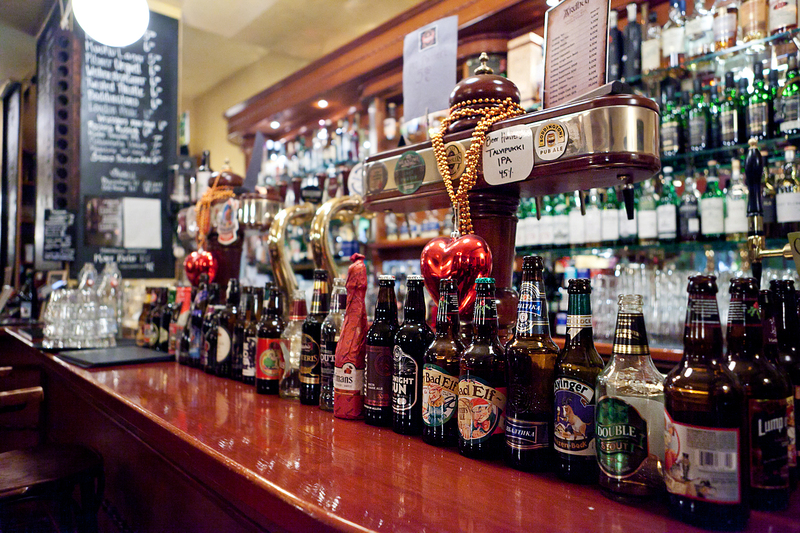 Not a single Finnish beer is commonly known worldwide, and only a few exceptions are exported. Still there is a lively microbrewing culture hidden beneath the mainstream ”let's get drunk with the cheapest thing in the market” style of drinking. 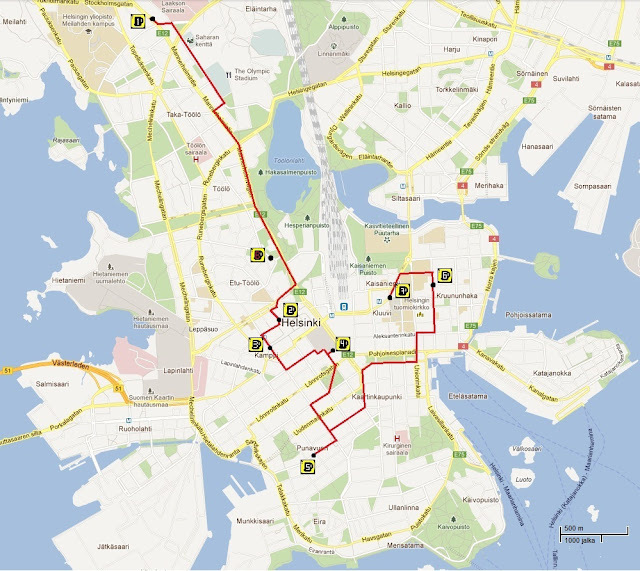 In order to make the Finnish beer culture more familiar, we now present this fabulous opportunity to take a tour around our beautiful capital Helsinki and its best sites while enjoying good beers in the best beer houses and bars in the city. The tour will introduce you to such wonderful places as the Olympic Stadium, Finnish House of Parliament and the Senate Square with its magnificent Lutheran cathedral. We recommend that you will reserve enough time for the tour, so you are able to enjoy both the beer and the sights. Especially during the winter when the sun goes down early, you should start the tour as soon as the bars open (about 2pm mon-fri and 12am in the weekends). Expensive it might be, it is guaranteed that you will taste plenty of lovely beers you have never tasted before! Located in Mannerheimintie, the unofficial main street of Helsinki full of fantastic sights. Viisi Penniä restaurant opened in 1956. 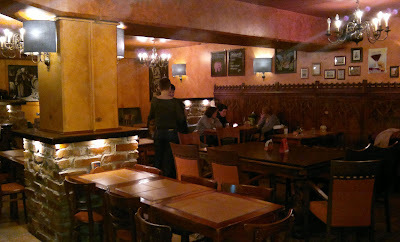 The pub has been open only since July 2011, although the small and cozy interior suggests that it has been open for ages. The pub is separate from the restaurant so be sure that you take the right door in. Viisi Penniä has a large variety of beers and an exceptionally good supply of Scottish whiskeys. With a good static selection of finnish microbrewery beers their taps are changing constantly - whenever a barrel is empty, a new beer of a different brand will take its place. The fact that Viisi penniä is starting its own import of foreign beers makes this rapid changing of taps even more attracting. It might be that the beer you're drinking in Viisi Penniä is after a week or two never seen again in Finland. But not only the taps are changing: this affects the bottles as well. The nice and very talented staff is pleased to tell you all about the beers currently on the list. If you get hungry while enjoying the good beers of Viisi penniä fear not! Operating closely with the restaurant, some foods can be ordered also from the pub. Lunch in Viisi penniä is good and easily affordable, and the daily changing courses vary from a hamburger to haggis. 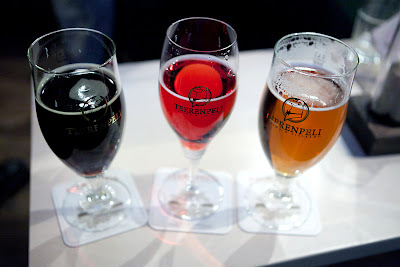 When talking about Finnish microbreweries, forgetting Teerenpeli would be like forgetting Paulaner from the list of German brews. 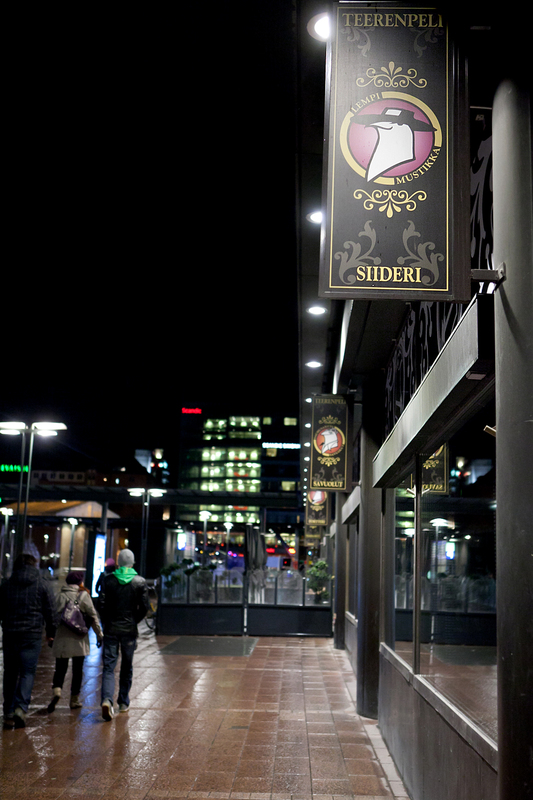 Rising from the city of Lahti Teerenpeli has restaurants also in the other largest cities of Finland. With almost 10 different ownbrewed beers and a few mind-blowingly good ciders Teerenpeli has also a distillery for its own whisky. Do not try to find any worldwide beer brands from the tap: All the taps in Teerenpeli are filled with their own products. Teerenpeli is very popular within both the beer specialists and the every now and then drinkers. Evening and night time on weekends it's usually always full and during weekdays it serves the role of a good afterwork place. 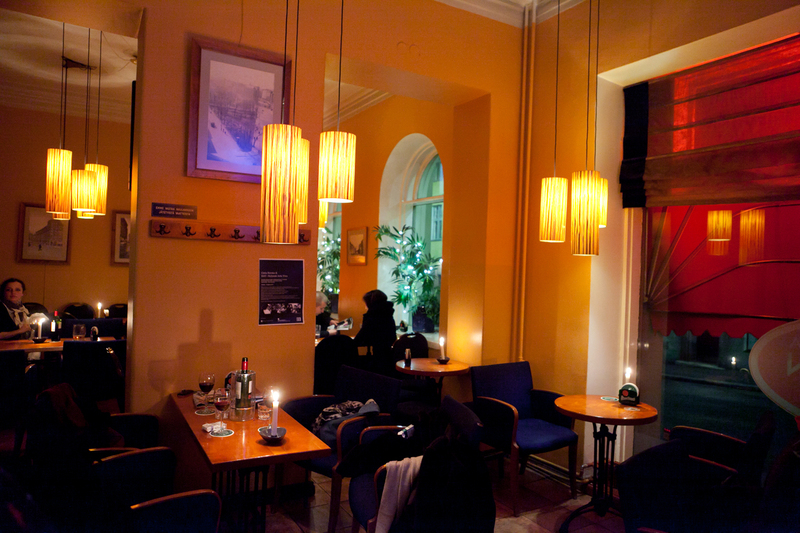 The decoration of Teerenpeli combines the traditional beerhouse elements to the Finnish culture with somewhat elegant twist. Its courtyard terrace is open all year from summer to the blistering cold of winter; the heater will ensure warmth every day! You could actually spend the whole evening in Teerenpeli just trying out all their different products. If you're about to take only one or two, we recommend that you focus on the ciders rather than taking only beers. To the eco-friendly customers Teerenpeli can proudly present their fully organic products served from the organic bar upstairs. Part of a Finnish brewery ”Saimaan Juomatehdas”, Bruuveri is a place to take the meaning of microbrewing to a whole new level. 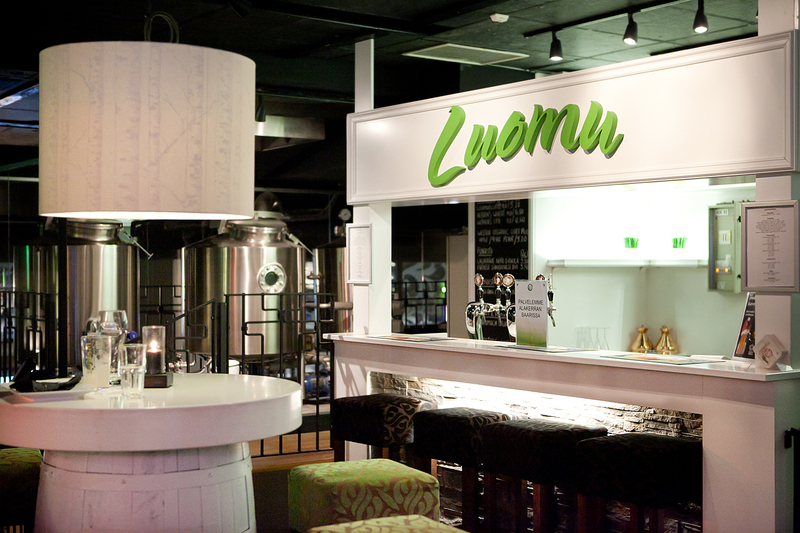 In addition to a good selection of foreign beers and the Finnish delights from the Saimaan Juomatehdas -brewery, Bruuveri also makes its own beer on location. Amount of beer made at a time is quite minimal: only 240 litres. With that amount, a beer can truly call itself a microbrew. While in Viisi Penniä you could drink beer never seen again in Finland, in Bruuveri you might drink a beer never made again anywhere, ever. Bruuveri is located in the first floor of the shopping mall Kamppi, and the change of atmosphere when going in to Bruuveri is spectacular. Suddenly all the noise and the fuss of people in the middle of an average shopping-spree is changed to cozy chit chat and the beerhouse-style furniture of Bruuveri. The long bar of bruuveri has as much as 15 taps, although some of them are filled with same beers. For lovers of Indian pale ale, Bruuveri brings relief with having usually at least one finnish IPA in tap. In Bruuveri, you can also enjoy something to eat with your beer. Kitchen is open until late evening. 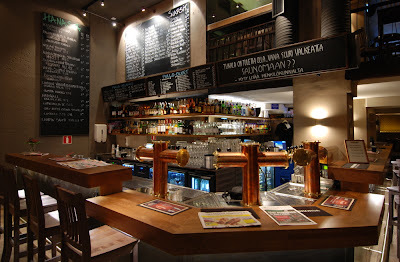 The food in Bruuveri is typical pub style, easily matching and conquering over the courses of a local burger joint. On Saturdays , Bruuveri also serves brunch (11am - 3pm) definetly worth trying! As has been noted before, Villi Wäinö holds its Finnish identity with pride. Furniture among all other little things are heavily influenced by the Finnish national epic Kalevala. 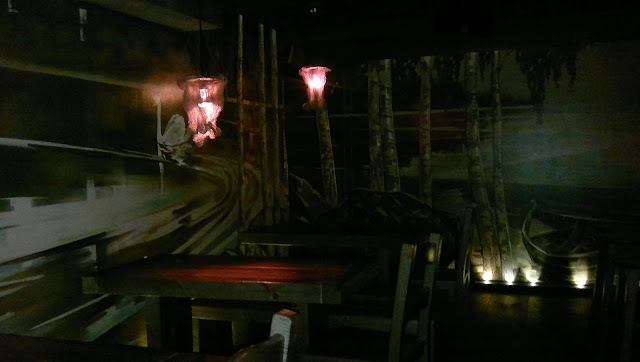 Interior makes you almost believe that Villi Wäinö would have its own house elf hiding in a corner somewhere. There is a DJ playing Finnish music every Friday and Saturday and the joyful music might sometimes even spark some happy dancing. There is also live music or even stand up comedy shows once in a while. Overall Villi Wäinö is well suited for being the happening place of a wonderful evening. Do not underestimate the size of Villi Wäinö on the first look, because although it might seem small and a bit cramp at first, Wäinö has for about 350 seats divided in several floors plus terrace and its famous musta sauna (black sauna). The sauna available for rent for a group of about ten persons with a relatively small price: 3 hours of sauna is 300€, including 150€ for drinks of your choice (2012). Definitely a place to have a party of any sort! Still, you do not have to book the sauna in order to experience something you have never experienced before. One or two good beers in some cozy corner of Wäinö will do the trick all the same. 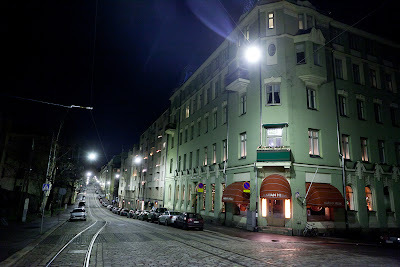 At this point of the trip you have mostly found yourself in the very central Helsinki, with probably a tourist or two. 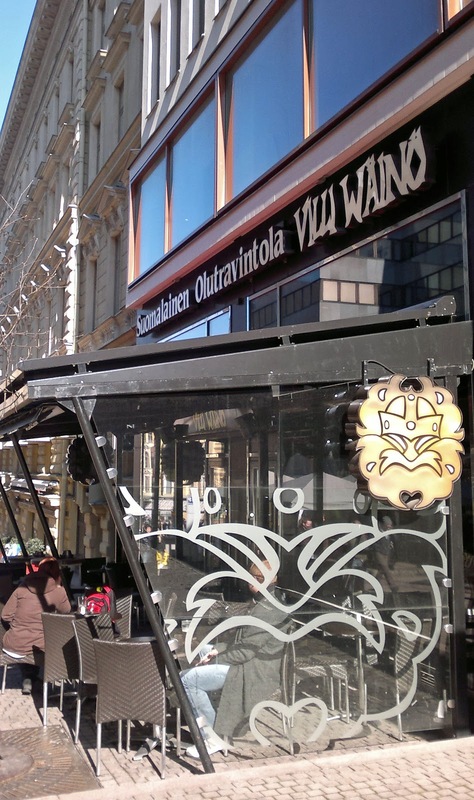 You might have been asking yourself: What has Helsinki to offer to the locals? We are not leading you to a lower working class pub in the faraway suburbs, but to a very good beerhouse in every way imaginable. Punavuoren Ahven is sometimes described as the heart of the district called Punavuori. 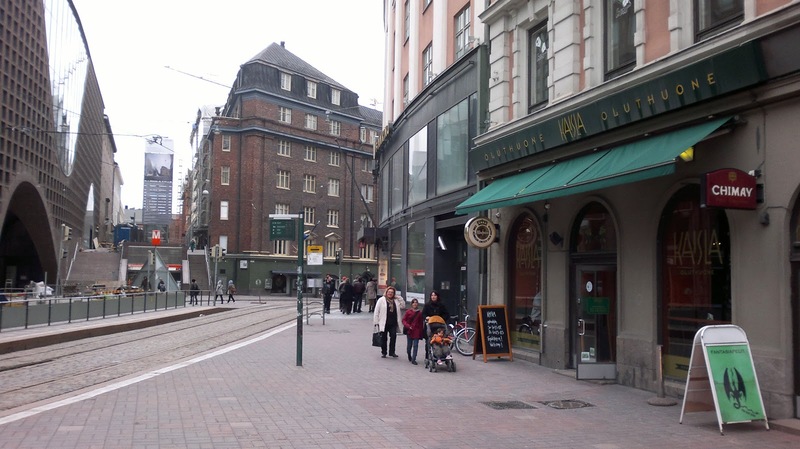 (Yeah, wonder how the restaurant got its name) which has the highest population density of all the districts in Helsinki. Punavuori is one of the oldest parts of the city. In the 19th century it served as a neighbourhood for many working-class families, but has since that transformed into a living place of the more wealthy citizens. Punavuoren Ahven is located in the middle of this historical area and many consider it as the ”living room of the local people”. Punavuoren ahven offer a good and rapidly changing menu of beers, including an exceptionally good selection of strong-hop ales and products from the Porterhouse brewery. 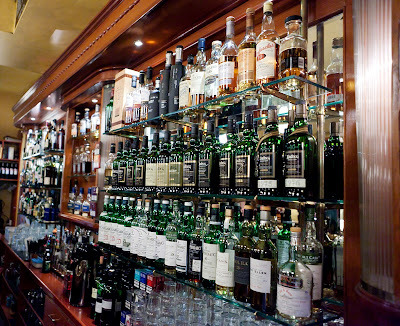 Furthermore Punavuoren Ahven has also Helsinki's largest variety of Islays for which they arrange whisky-tasting nights every now and then. They also arrange whisky- and beertasting nights on request, but it should always be asked early enough. want the cabinet, because the air in a full-of-people Punavuoren Ahven might not always be the lightest of a kind to breathe. You do not have to spend a lot of time in Punavuoren Ahven to understand its success among locals. 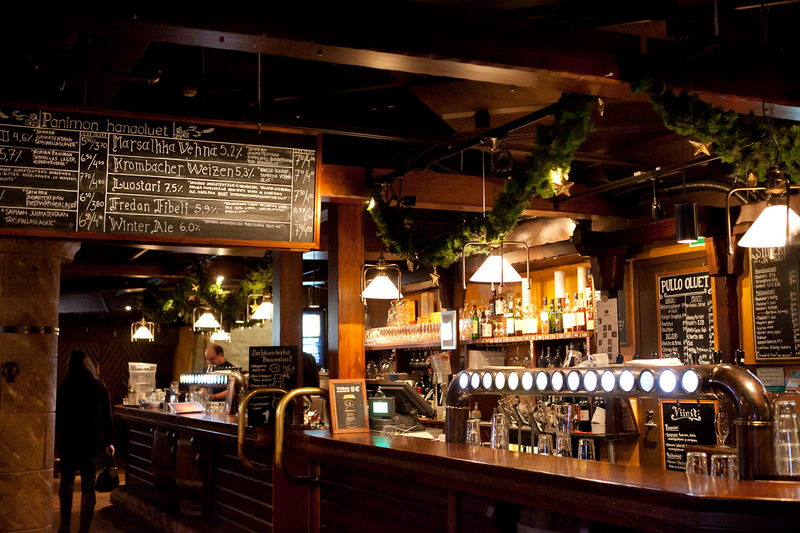 It is guaranteed that the first time in the pub already feels like home. You may or may not be familiar with the history of Helsinki and Finland as a whole. Either way, the journey to Marian Helmi will guide you through some very important historical places and beautiful buildings. You will be seeing for example the Senate Square, build by the order of Russian Tsar Aleksander II in the early years of 19th century, the House of the Estates and the Bank of Finland. 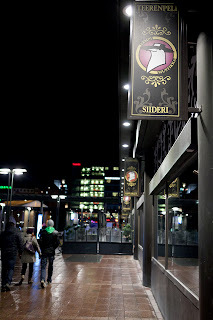 Located anywhere else in Helsinki, Marian Helmi would propably not grasp our attention, but due to it being the only decent beerhouse in the area it makes an excellent pit stop for a pint. Marian helmi has been on its location in a form or another since the 30's. It has a good reputation within the teachers and staff of the University of Helsinki, and is a well-known after-lecture place. Also some ministers of the Finnish Parliament might sometimes be seen coming from the House of the Estates to enjoy a beer or a glass of wine. Marian helmi is a place for friends and conversation. It is neat and peaceful place with a warm atmosphere. It is not a place where you would find loud drunkards raging about which Ice Hockey team is the best. This can very well be seen just when looking the furniture or the prices of drinks. There is also something very unique about Marian helmi which desires attention: In one of the walls, you can find the largest one-piece mirror in Finland! For those who are also interested in seeing the ”dark side” of the Finnish beer-culture, Marian helmi is the neighbour of a famous karaoke-bar called Pataässä, where you can buy relatively cheap Finnish tastes-like-water lager and see all the drunken Finnish people trying to sing Proud Mary correctly. There might be no better place to end the trail than Oluthuone Kaisla. Many things back up the fact that Kaisla is often considered as the number one beerhouse in Helsinki. The restaurant has 33 taps and almost 200 varieties of bottled beer, which makes for the largest selection in Finland. Kaisla has a very talented staff eager to give recommendations and to spread knowledge about the beers they serve. They are also proud to tell that Kaisla has been selected as the best beerhouse in Finland not just once, but several times. 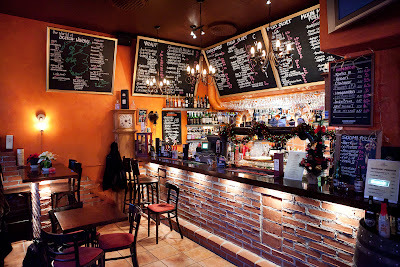 The interior of Kaisla would propably be best described as a warm and stylish beerhouse, with welcoming and lively atmosphere. 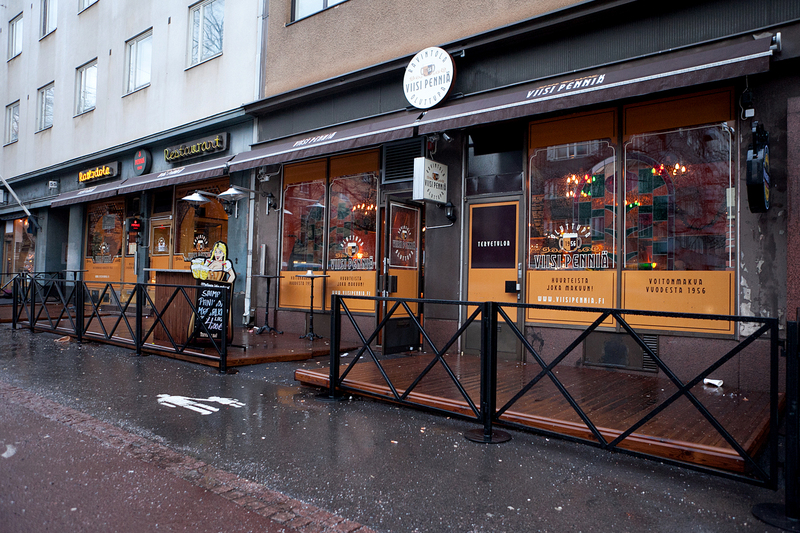 Kaisla is one of the biggest beer-centered restaurants in Helsinki, which can be proven by the mere fact that the restaurant has two separate entrances from different streets, both with their own bars. Despite having a great number of seats, at least in the weekends Kaisla somehow manages to be full to the limit.. The overall selection of the taps is quite static, but there is also monthly changing tap beer, specially chosen to match ongoing season of the year plus six taps fully dedicated to Finnish microbreweries. 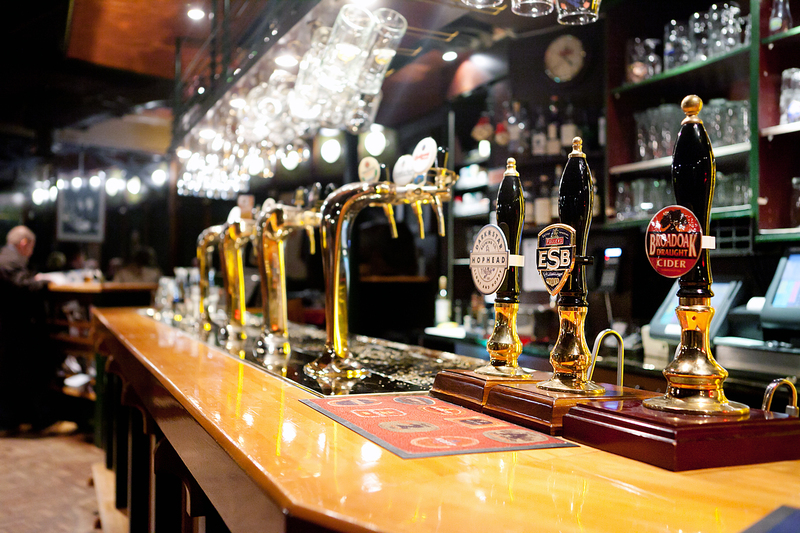 Although being the last stop of this beer trail, you do not have to spend all the night there. Kaisla is located right above the Kaisaniemi metrostation, one of the very few in the city. Also being near the Casino, all the night clubs and the Central Railway Station, Kaisla is in a perfect place for whatever plans you have for the night. The walk from Viisi Penniä to Teerenpeli can be quite exhausting even with all the sights to see. There are plenty of cozy pubs along the way, but if you consider yourself to be a bit of an extremist when it comes to beer, there is only one place worth of consideration. St. Urho's Pub has a wide selection of beers and wines, but one item on the menu stands out. This pub is the best place in Helsinki to try a pint of Sahti, traditional finnish unfiltered homebrew. The taste is unforgettable to say the least, and if your next morning-after has some extraordinary features, this is probably the cause. 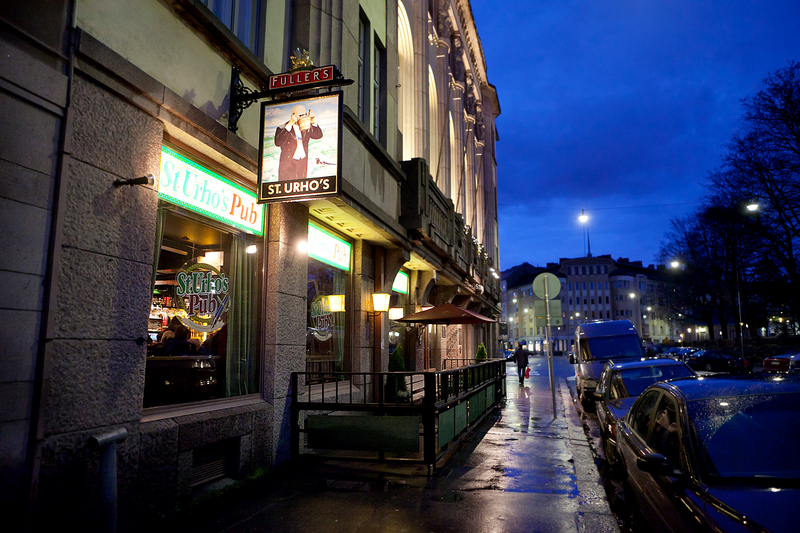 The pub's named after Urho Kekkonen, the longest serving and most legendary Finnish president, a huge cult figure in Finland. It was established in 1973 and has since then been the place-to-be for artists and patrons of arts. Your standard customers would be middle-aged well-to-do couple discussing the latest happenings in the Finnish Opera scene. The prices reflect this, especially when it comes to food. This doesn't mean the food should be avoided though, the adjacent restaurant Manala is one of the best restaurants in Helsinki. 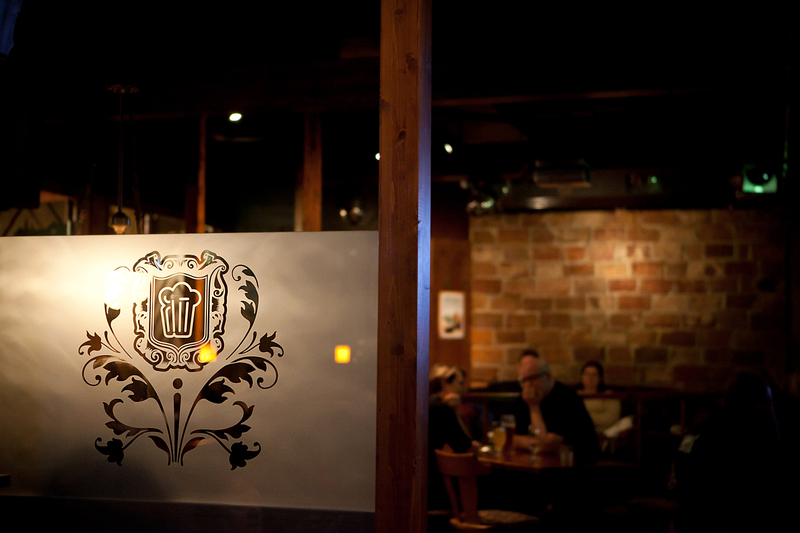 This Beer trail was inspired by "The Beer Book" by Tim Hampson. We hope that this beer trail will introduce you to plenty of new beers, places and experiences. Enjoy Helsinki and remember to drink responsibly! All photos except from Oluthuone Kaisla & Villi Wäinö: copyright Juha Valkeajoki. Travel theme. Theme images by peepo. Powered by Blogger.